Hello! 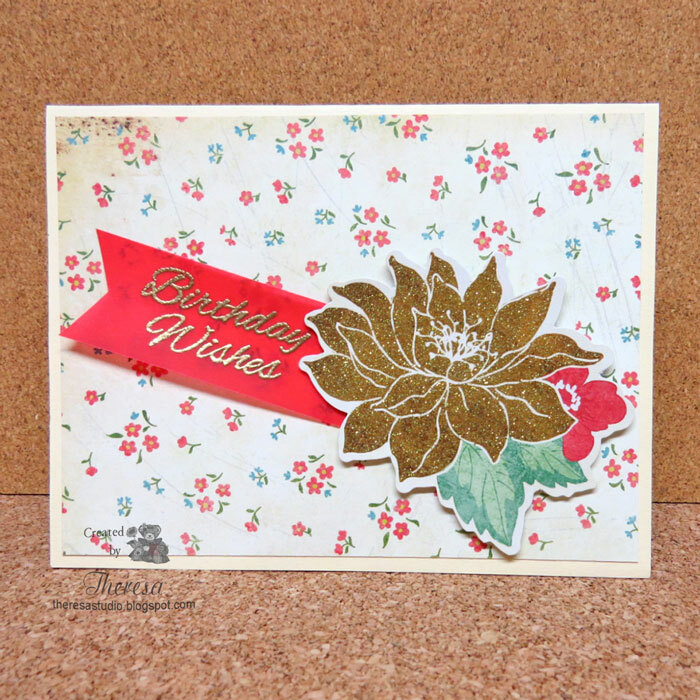 I made this design using the Sketch from this month's Challenge #14 at Outside the Box and used Memory Box's die English Rose Stem. 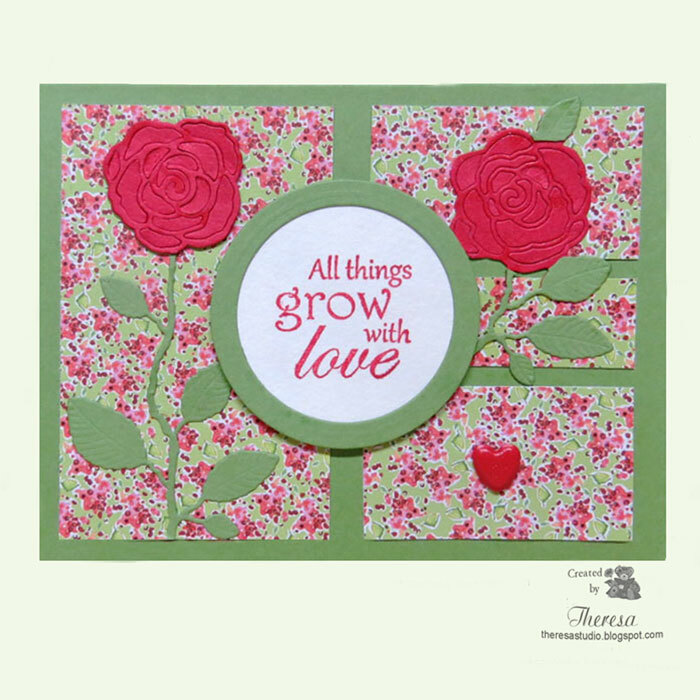 I used Red and Green CS, gcd Studio pattern paper from Ambrosia pad, watercolor paper for the sentiment, GKD sentiment from Birds and Blossoms, circle dies, and a Red Heart Brad. Hello! Getting an early start on Christmas with this one layer card. Power Poppy Stocking and Sentiment stamps (Poinsettia Set) were inked on GKD Heavy weight CS with Memento Tuxedo Black ink. I colored the image with Copics.....they do not bleed on this CS so it is perfect when making a one layer card colored with Copics. I added some glitter with Stardust Pen and embossed a border with Cuttlebug EF that I inked with Memento Ladybug ink. 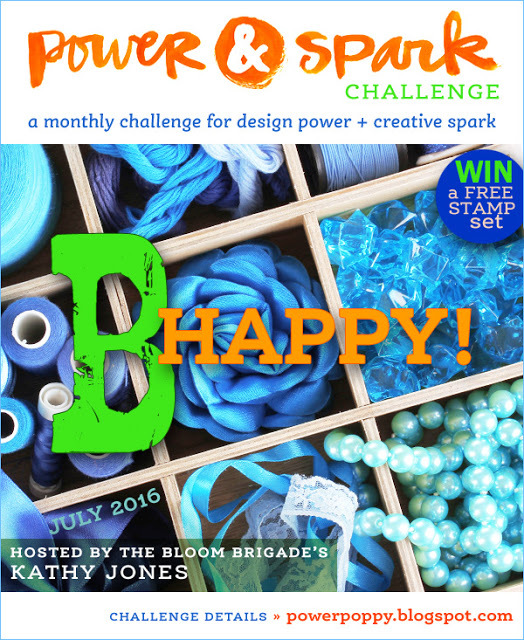 Power Poppy Power & Spark Challenge: B Happy-use things that begin with B- Used stamp with box and bow, a B in Bright, and a Border(embossed). Hello! 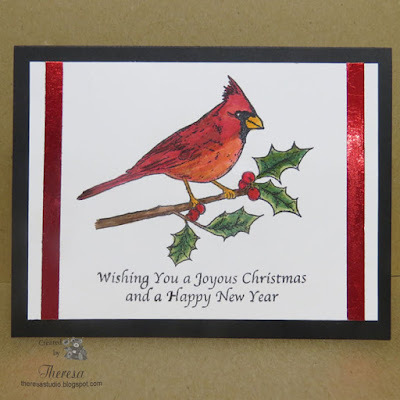 I am sharing another Christmas card made with a Partridge in a Pear Tree die that was free with a purchase from Cardmaking and Papercraft. The die was cut from Gold metallic CS and Placed on another die cut of an Ornament from DCWV Red Foil CS. This went on Frame cut from White CS with Spellbinders Divine Elegance die. This was assembled on a card base of DCWV Shimmer Gold CS and finished with Metallic Gold Twine and a Penny Black Sentiment from Wonder Collection heat embossed with Gold EP. 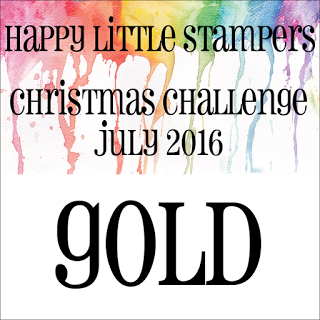 Happy Little Stampers July Christmas Challenge: Make sure Gold is prominent on your card. 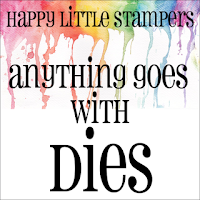 Happy Little Stampers: July -Anything goes with dies. Hello! There's no better way to keep cool on a hot day than thinking of Christmas. Since there are several challenges this month to create Christmas cards, that is what I did using GKD Stamps from Peace and Joy set. I colored the Cardinal with Copics after stamping on GKD White CS with Memento Tuxedo Black. To "dress up" the card I added 2 strips of Red Foil using Clear Snap Foil and double sided tape. 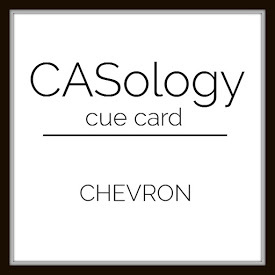 I attached to a card base of Black CS. Hello! 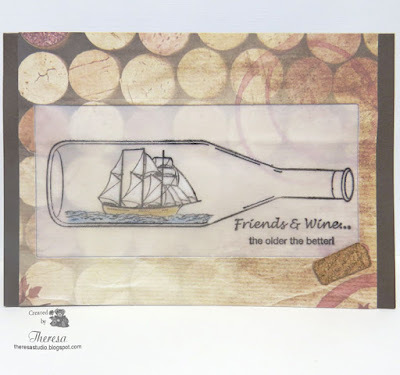 I found this At The Vineyard Paper House pattern paper with wine corks in my stash and thought it would be perfect with my stamping of a Ship in a Bottle on Vellum Paper that I did with Repeat Impressions Wine Time set. I did the stamping with Memento Tuxedo Black ink and then heat embossed with Clear EP. I did a bit of coloring on the ship with White, Blue, and Tan Pencils on the backside of the Vellum. 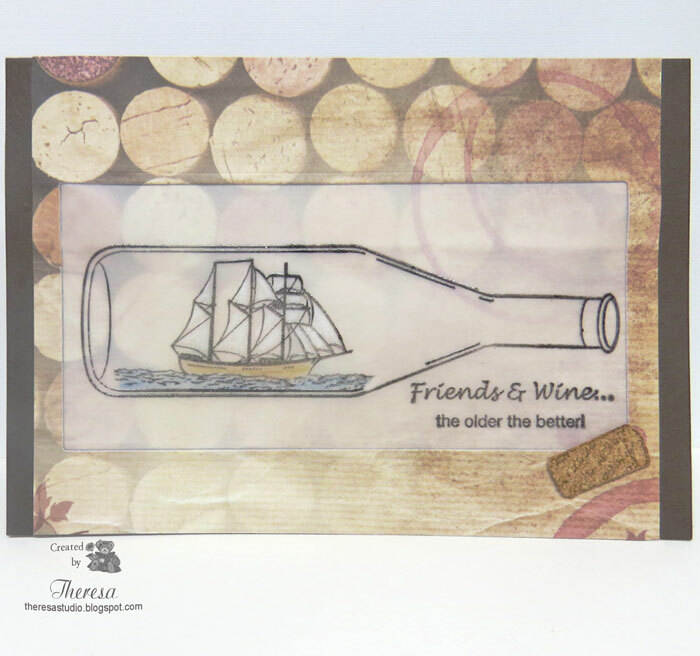 I cut a rectangle from the Pattern Paper, attached the image on vellum behind the opening and then replaced the rectangle behind the image to create a frame around the bottle. I used a Dark Brown CS for the base. For fun, I stamped the larger Cork Stamp on cork and trimmed and then attached to the card. I like the masculine look of this card. I first stamped this design on white CS but the vellum show the bottle so much better. The House That Stamps Built: Designer Choice Challenge 713 It's a Man's World. Craftyhazelnut's Patterned Paper Challenge: Any card with Patterned Paper. Welcome! I am not very good with color challenges but I like the challenge at Color Throwdown and just had to give it a try. I am not too fond of purple but it goes very well with the other chosen colors. 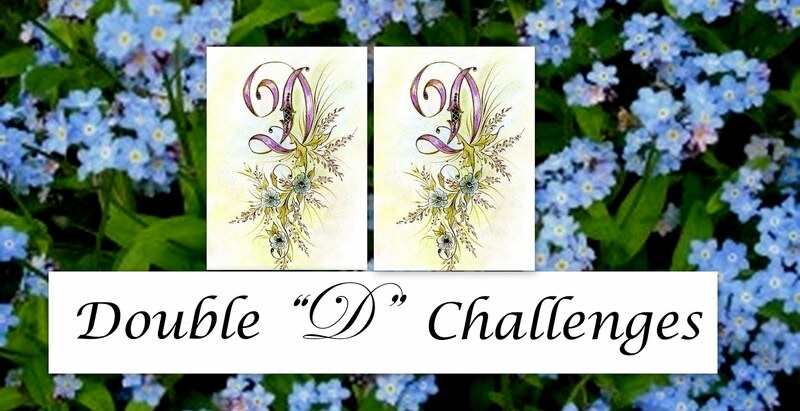 I was very inspired by the DT card by Lori and I guess you would say I CASE'd it. Hope she does not mind. I sponged SU Lovely Lilac, Rose Red, Regal Rose, and Creamy Caramel which seemed to match up close to the colors to use. I used water color paper and was pleased with the outcome of the sponging and the subtle texture. I stamped GKD stamps from Wild Blossom set which I had been anxious to use. Inked with Memento Tuxedo Black and heat embossed with clear EP. 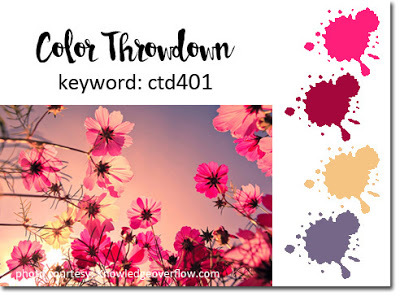 Color Throwdown: #401 Use dark pink, burgundy, pale peach and purple. 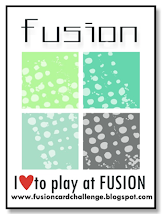 Just Us Girls Challenge: Trend Week #351 Sponging. 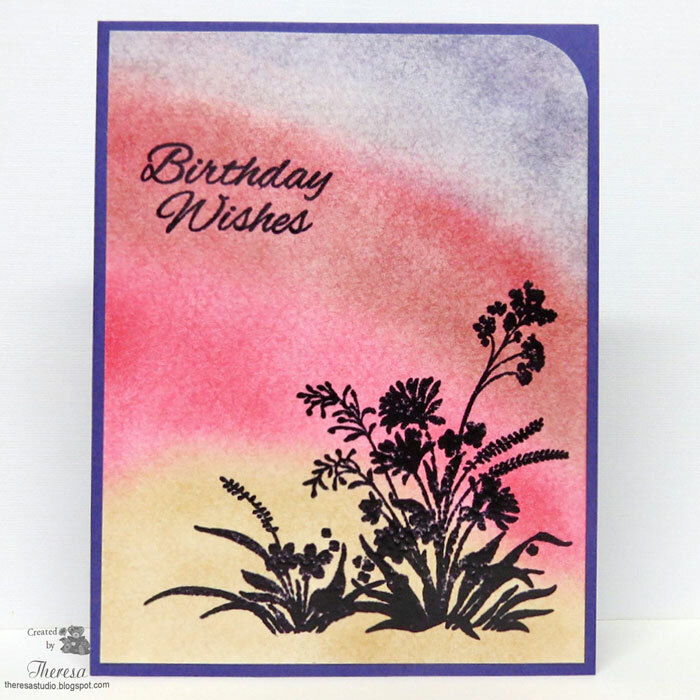 I sponged 4 colors on water color paper as background for silhouette stamping. Simon Monday Challenge: Use Flora and/or Fauna. Chose to use Flora. Hello! I have another One Layer card with the theme of Time. 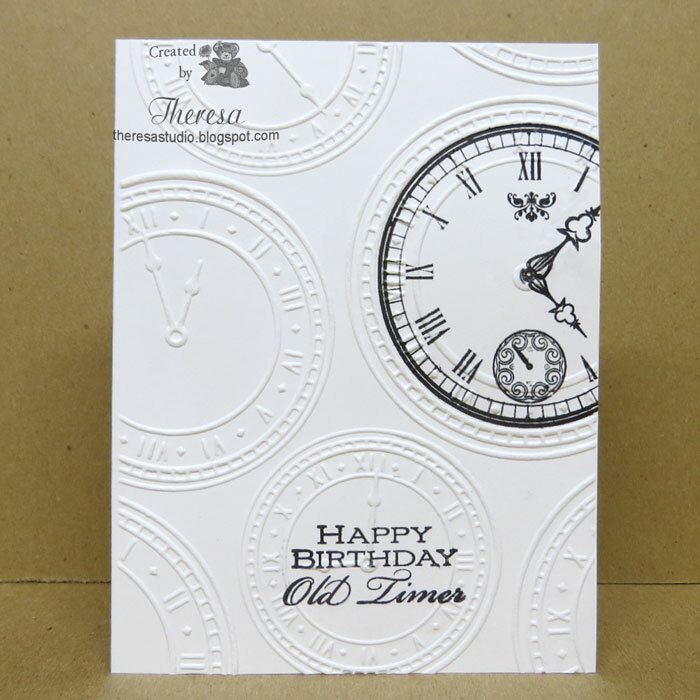 I used more stamps from Flourishes Moments in Time set with an embossing folder from Darice called Clock Background. 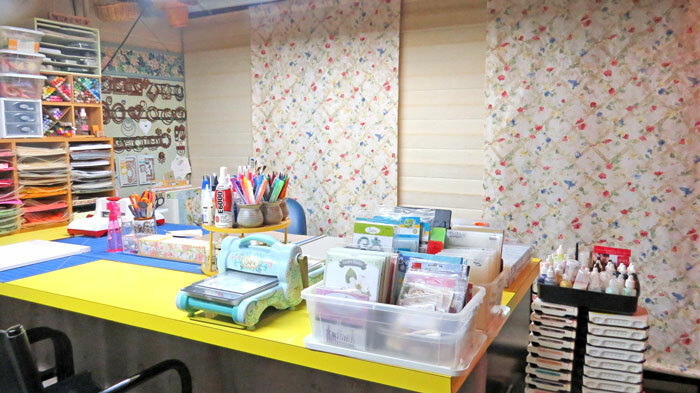 I used my Misti to line up the stamps and the embossing .... I stamped on GKD White CS with Memento Tuxedo Black ink before actually doing the embossing. Make sure the ink is dry before embossing or you may get smearing.....I learned the hard way. 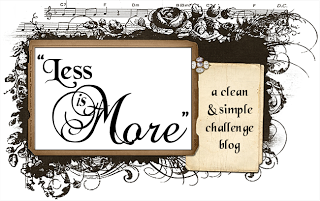 Less Is More: Week 284-It's TIME for another One Layer challenge and this time the theme is TIME. And this a second card for the challenge. 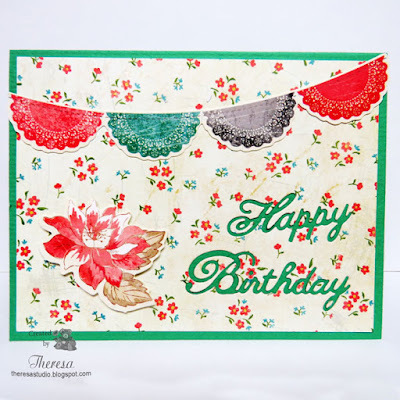 Tuesday Throw down: TTD302 One Layer. Hello! 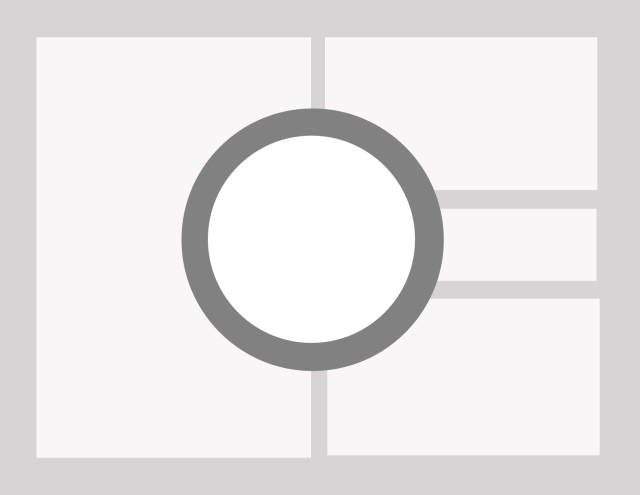 My One Layer card has the theme of Time. I used the Hour Glass stamp and sentiment from Flourishes Moments in Time set. 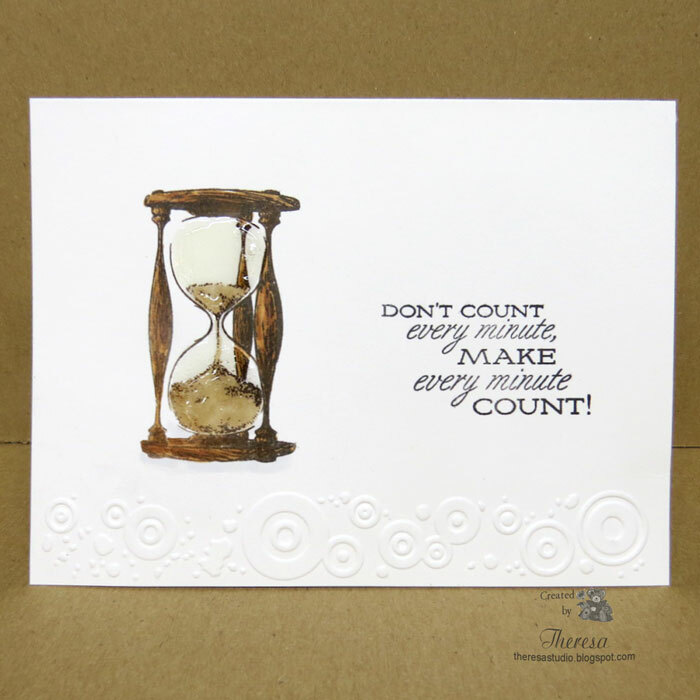 The hour glass was stamped with Memento Rich Cocoa ink and colored with Copics and then coated with Glossy Accents. 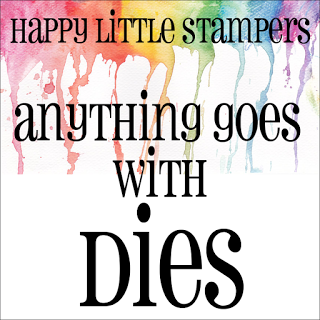 The sentiment was stamped with Memento Tuxedo Black ink and I added a dimensional border with Cuttlebug EF Pop Culture. I used GKD heavyweight CS since Copic markers do not bleed through this great CS and it is perfect for One Layer cards colored with ink. Less Is More: Week 284-It's TIME for another One Layer challenge and this time the theme is TIME. 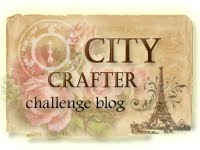 City Crafter Challenge Blog: Week 320 On the border. I used an embossed border on my one layer card. Time Out Challenges: #61 Inspired by words. Hello! My card today is made with Gina K Design stamps from A Year of Flowers (rose), Pressed Flowers (rose), Say It with Flowers (sentiment) and a newer set Tiny Textures (splatters). I just played with the splatters as a background behind the single rose after masking the flower. 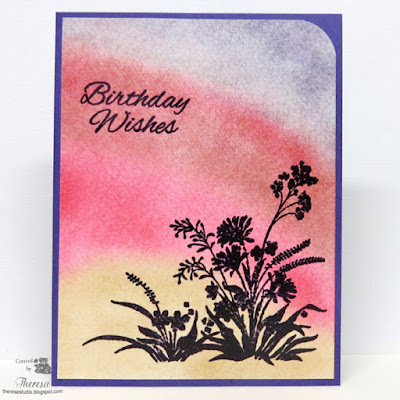 Creative With Stamps: Challenge #4 Ink Splatters. Used a stamp for my splatters. Hello! This card was inspired by Pattern Papers from my stash which I came across when going through some items I had stored away. 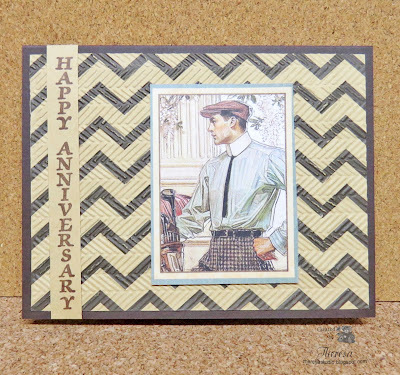 The Chevron pattern is from a Bo Bunny gift bag pack purchased at a closeout sale and the vintage image is from Graphic 45 pad. Not much work except to assemble the papers with a Brown CS base. 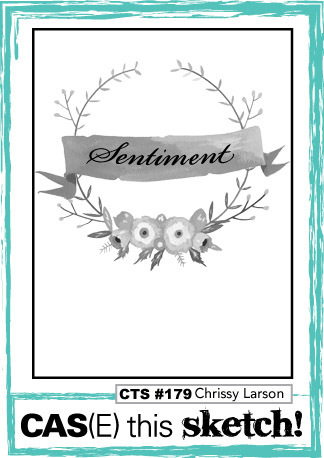 The sentiment stamp is from Repeat Impressions stamped with Memento Brown ink. Used a Argyle EF to give texture to the Chevron Stripe paper. Cards in Envy: Stripes Challenge. Have Chevron stripes and also stripes on the man's shirt. Welcome! 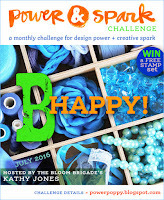 Today I have a card made for the WIW Color Challenge at The House That Stamps Built. 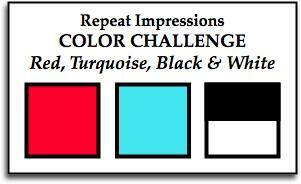 We are to use Red, Turquoise, Black and White. 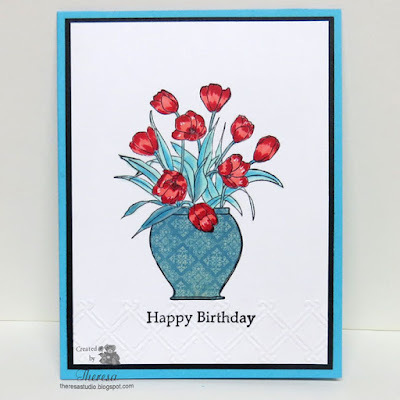 I stamped Repeat Impressions Vase Of Tulips with Memento Tuxedo Black and colored the tulips and leaves with Copics. Instead of green leaves, I took artistic license and made them shades of turquoise. I paper pieced the vase with some MME patterned paper. I stamped a portion of a RI sentiment and dry embossed a border at the bottom of the image panel. Finished with a Turquoise card base and a mat of Black CS. Hello! Playing with some gingham and a flower design. I began by stamping a Flower from GKD Hello Friend set with Memento Rose Bud ink and colored with Pink Copics and added some Wink of Stella for shine. I fussy cut the flower and popped up on a Oval cut from glossy white CS. 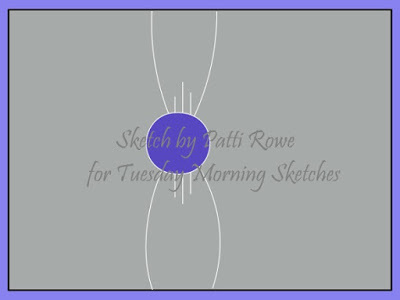 I assembled the card using the layout from Tuesday Morning Sketch. The base is a Shimmery Pink CS layered with Glossy White CS mat embossed with Cuttlebug EF Gingham. 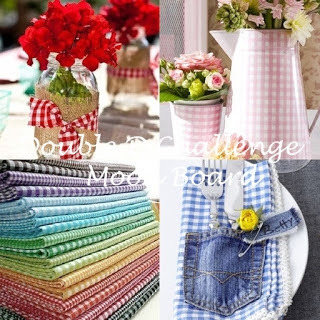 I attached Pink and White Gingham ribbon and then the Flower image. 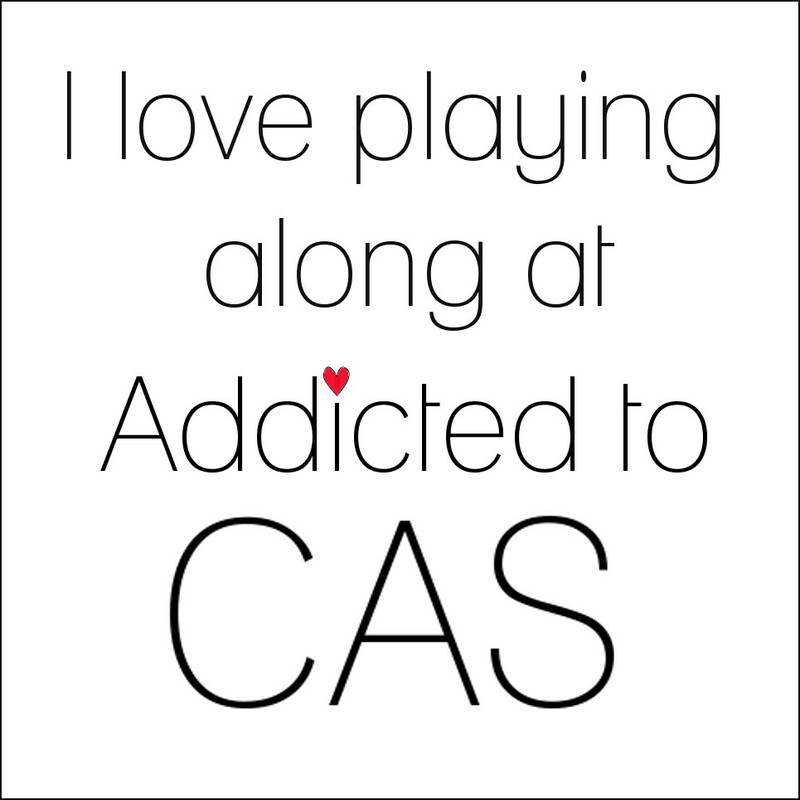 The sentiment is from the same GKD set. Hello! I have not seen many lighthouses in person but I enjoy the different shapes and designs. 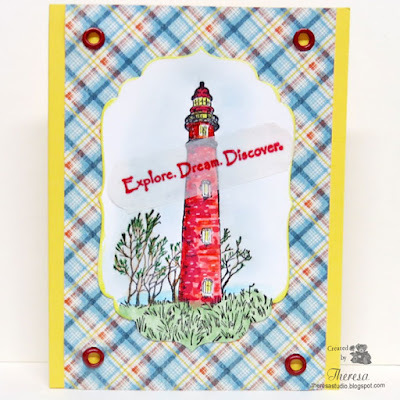 I came across this Just For Fun Stamp when I was looking for a Lighthouse stamp and thought I'd use it for another card with this theme. 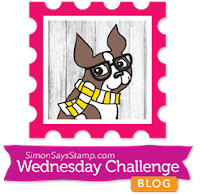 I won this stamp in 2010...nice to have a post on my blog to remind me of the date. I tried to color in a way to make the bricks appear to be old. Used some pattern paper from Graphic 45 pad, yellow CS for base, some red eyelets from stash. Cannot remember the last time I used eyelets on a card. The GKD Sentiment was heat embossed with red EP on clear vellum and cut with label die. I also used a Spellbinder die for the image. Crazy 4 Challenges: C4C343 Honor lighthouses on your card. 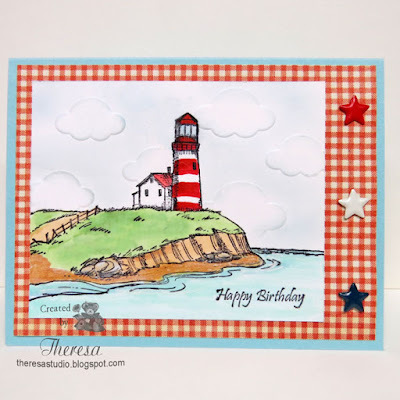 Sweet Stampin' Challenge: Summer/Holiday Destination-lighthouse by the sea. 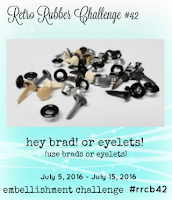 Retro Rubber Challenge: #42 Brads and Eyelets. I won the Lighthouse stamp in 2010 in a card challenge. 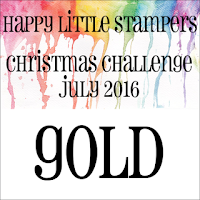 Addicted to Stamps: Challenge #201 Anything Goes. Mod Squad Challenge: Lazy Days Of Summer---another lighthouse entry. This one is for you Dianne. Where are you spending the summer? Wouldn't a trip to a lighthouse and the ocean be a fun time? 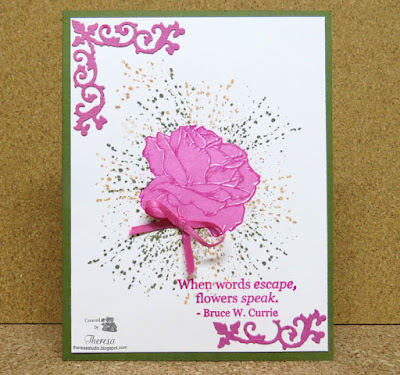 I pulled out this Art Impression stamp to create this card for several challenges. I stamped with Memento Tuxedo Black ink and colored with Copics and sponged the sky with Memento Summer Sky ink. The sky was embossed with Darice EF Clouds before sponging. I backed the image with Graphic 45 Gingham pattern from By the Sea pad. Attached this to a Blue Card Base. Added some star brads from my stash and a sentiment from GKD Gifts of the Sea set. 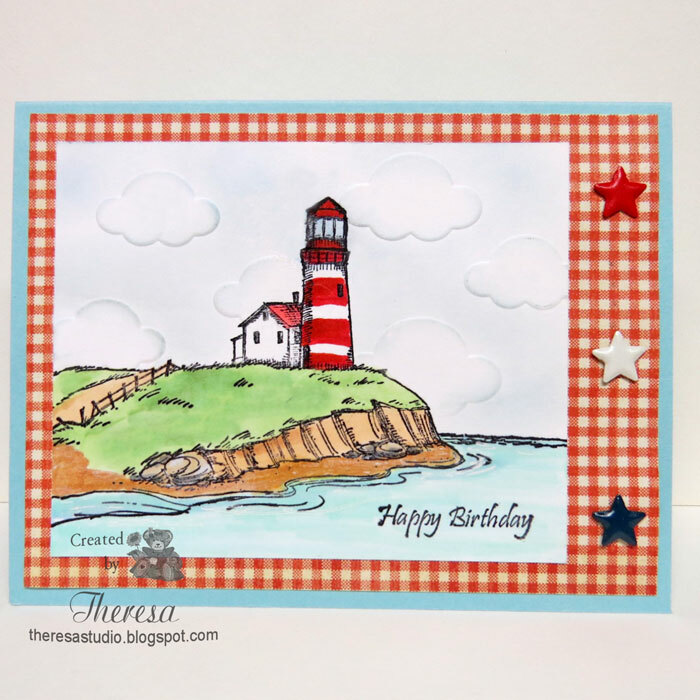 Sweet Stampin' Challenge: Summer/Holiday Destination-going to the lighthouse by the sea. Retro Rubber Challenge: #42 Brads and Eyelets. I won the Lighthouse stamp in August 2013 in a card challenge. I have had the brads for a number of years and happy to have a reason to use them. Double D Challenges: Simply Gingham. Thought this Gingham paper was great with this image. 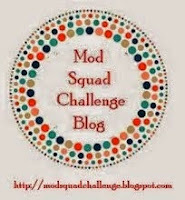 Mod Squad Challenge: Lazy Days Of Summer---great spot to be lazy is by the ocean. Hello! 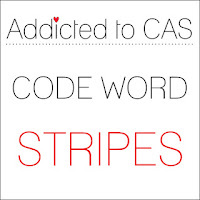 I was playing with some new GKD Stamps and created this CAS card using the sketch from CAS(E) this Sketch #179. I used Flowers from Birds & Blooms, Sentiment from Wild Blossoms, and stems from Old Country Rose to create an open wreath. I stamped all with Memento Tuxedo Black and colored the petals and leaves with Pink Copics. 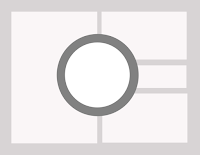 The card base and label are GKD Pink CS. Stamp TV: Mix It Up Monday-Fantasy Flowers. 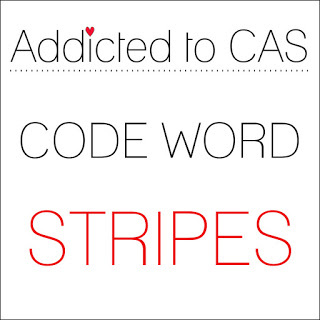 CAS on Sunday: #86 Black and White and One Color. Used pink as my color. Hello! I made this tag with some of the Crate Paper DIY Collection that I had lying on my desk. 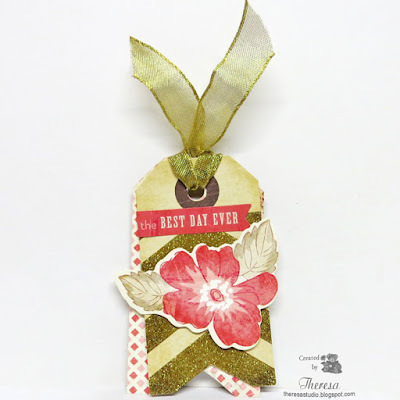 I took a precut Tag with Gold Glitter Chevron designs and cut a tag the same shape and size from a Pattern Paper and tied the 2 together with Gold Metallic ribbon. 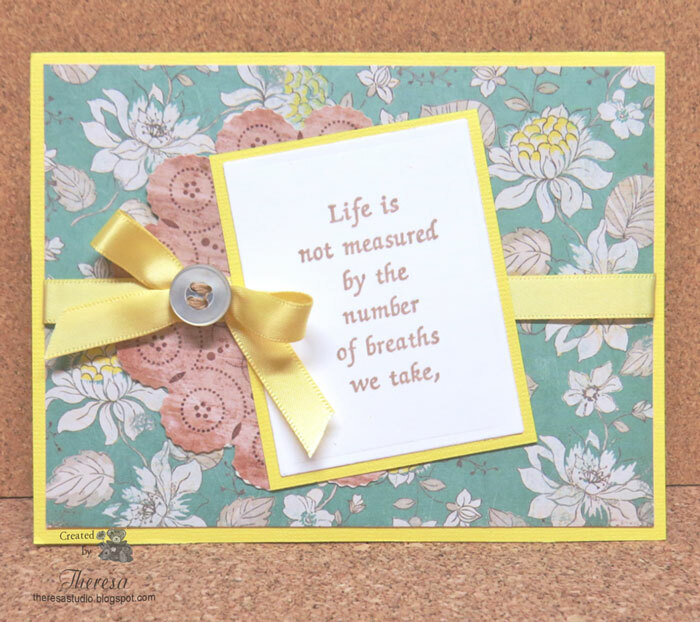 I added a precut Flower and sentiment from the collection to finish. Easy enough! 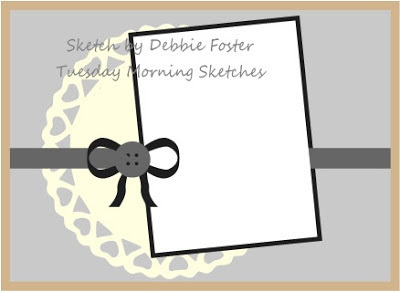 I was inspired by the layout, shape, and use of Pattern paper of the tag created by Kelly Szafron from the current Tag You're It! 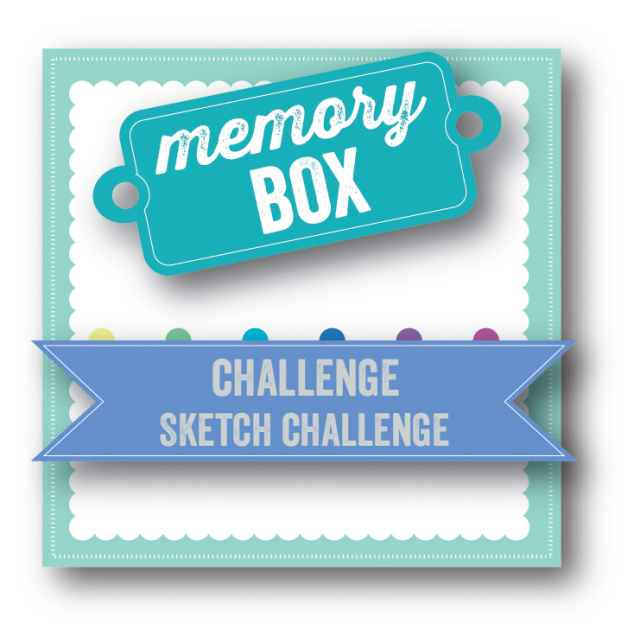 challenge #50. 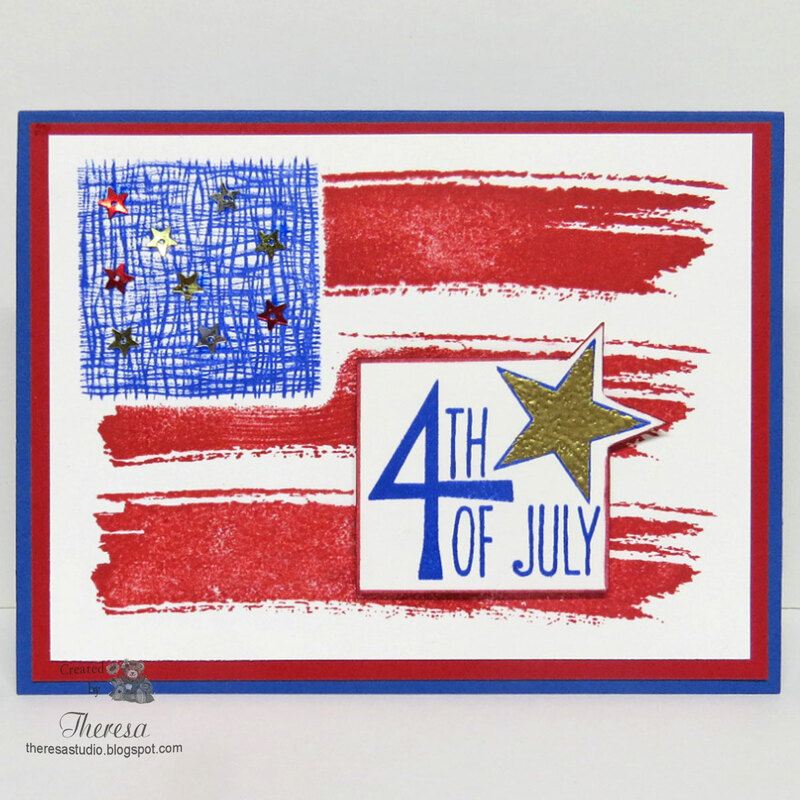 I just had to make a card to share today for the 4th. I got the idea for this card made by Jennifer for a challenge on Stamp TV. I used the same GKD stamps from Tiny Textures set for the flag design as Jennifer but used Verve stamps for the image. I gold embossed the Star and added some Star Sequins to the blue square. I used SU Ruby Red and Brilliant Blue inks and SU Brilliant Blue CS and GKD Red and White CS. Just Add Ink: #3 challenge Just Add S. I used stamps, stripes, stars, sequins. For the people in the USA, have a happy and safe day as you celebrate our country's freedom. Hello! 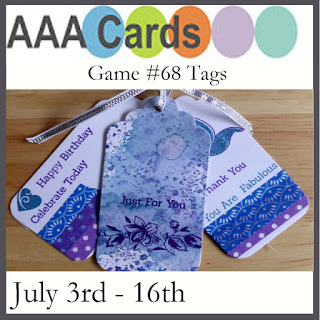 I do not usually include more that one card in a post but today I am showing 2 cards that I made using Patterned Papers and Pre Die Cut Flowers and Banners from Crate Paper DIY Shop Collection. I am trying to use some of the items from my old stash and I love to create cards from patterned papers. The top card has an GKD Ivory CS base with a layer of mini floral pattern topped with a flower die cut with Gold Glitter. I stamped the GKD Birthday Wishes from Wild Blossoms set with Versamark on red Vellum strip and heat embossed with Gold EP. 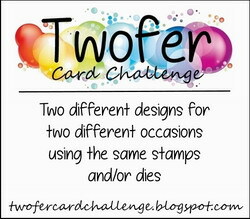 Time Out Challenges: Challenge #60 CASE With Your Own Twist ...Card by Therese shown below left. I used her layout, sentiment on vellum at a slant, and floral theme. I changed up the colors and background design. 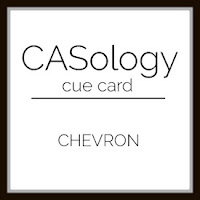 The card below uses the same pattern paper with a green card base. I added the precut doily banner and flower. 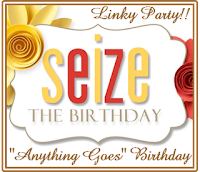 The Happy Birthday was cut with Cheery Lynn dies from the top layer so that the words show up in green. Hello! My card was made with a Repeat Impressions verse stamp that I used a portion on the front and stamped the balance of the words for the inside using Memento Toffee Crunch ink. For the layout I used Tuesday Morning sketch challenge with a yellow Card Base and a Layer of Patterned Paper from Crate Paper DIY collection. The "Doily" was a pre cut design from the same collection and I used a circle die to cut some of the same pattern for the inside. 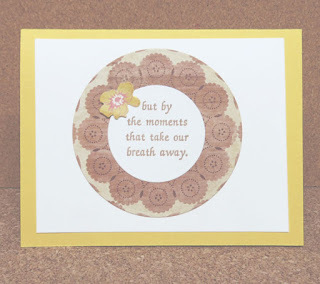 The sentiment was die cut with rectangle die for the front and a circle die for the inside. 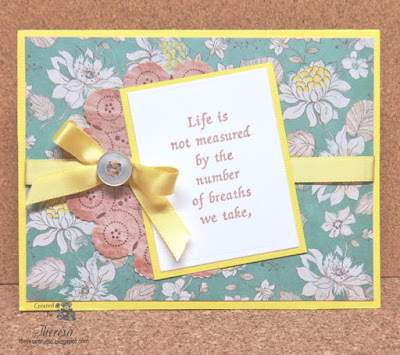 I finished the card with Yellow Satin Ribbon and a button from stash. The button was already threaded in the perfect color.....must have been recycled from a garment. 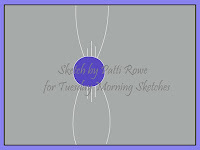 Tuesday Morning Sketches: # 358 shown below.